Wharfdale is a brand well known to stereo hobbyists and professionals for more than half a century. 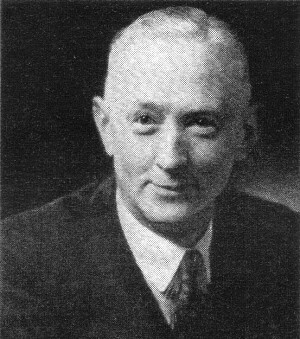 Wharfdale Wireless Works was founded by British entrepreneur Gilbert Briggs in 1933, and still sells speakers under the name 'Wharfdale.' As a pioneer in high fidelity sound reproduction, Mr. Briggs was highly sought as an author by electronics and audio media. In May 1957, he wrote this article for Radio & TV News magazine. 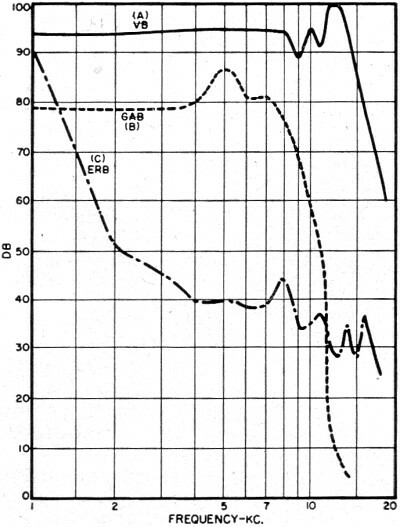 Studies of the audio response of the human ear and the physics of the space where speakers and listeners would be were undertaken as the electronics age progressed in the post-war years and consumers began seeking more than simply noise emanating from a loudspeaker. Editor's Note: We take great pleasure in welcoming to these pages one whose wide experience and knowledge truly entitle him to be called a "noted authority" in the hi-fi field, Mr. G. A. Briggs' pre-eminence stems not from a theoretical, ivory-tower approach to the subject, but rather it is the result of endless experimentation, a well-developed sense of inquiry, and a serious (although good-humored) interest in good audio reproduction. Besides all this, Mr. Briggs has the peculiar ability to tell of his experiences in a crystal-clear, personal, down-to-earth manner that is a pleasure to read. G. A. Briggs is managing director of the Wharfedale Wireless Works Ltd., England, which is engaged in making loudspeakers. Mr. Briggs started constructing acoustic phonographs, radios, and loudspeakers as a hobby around 1930. He started making speakers commercially in 1933. He has also dabbled in pianos and during the course of the last 25 years he has had forty different instruments in his home. Mr. Briggs is the author of the best-seller, "Loudspeakers," which is now in its fourth edition, as well as the popular "Sound Reproduction," "Pianos, Pianists, and Sonics," and "High Fidelity - the Why and How for Amateurs." Also, during the last three years, he has conducted nine lecture-demonstrations on sound reproduction in Canada, England, and in Carnegie Hall, New York. We feel quite sure all our readers will derive both pleasure and profit from Mr. Briggs' series, "All About Audio and Hi-Fi," which begins in this issue. Managing Director Wharfedale Wireless Works Ltd.
Part 1. An informative and interesting series that will discuss high fidelity reproduction from the listener's point of view. Opening article describes the main qualities of the human ear as they are related to sound reproduction. As the year 1956 was drawing to its quasi-peaceful close, I was very pleased to receive from the editors of this magazine an invitation to contribute a series of articles on audio topics, now generally designated as hi-fi. Because I am constantly making tests and experiments, it is very useful to have an incentive to place the results on record whilst they are fresh in the mind. In these experiments I have the valuable cooperation of our technical director, Mr. R. E. Cooke, B.Sc. (Eng. ), who joined my firm some two years ago after spending a few years in the Designs Department of the BBC where he was engaged on problems connected with sound recording and reproduction. Fig. 1. 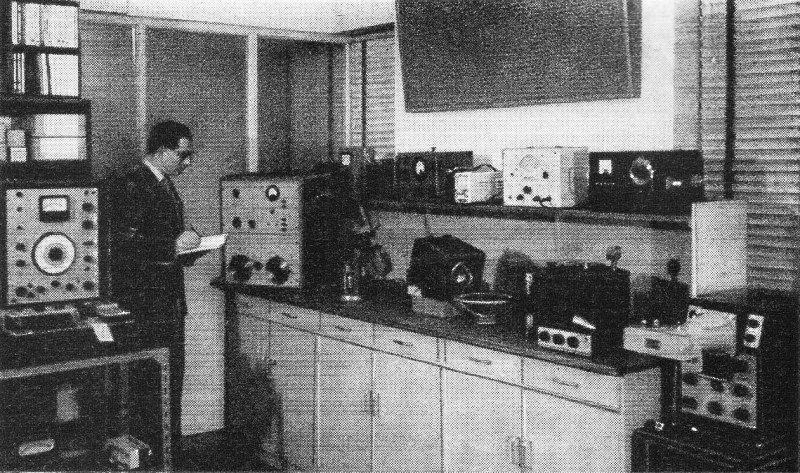 Photograph of the main items of test equipment used in tests forming the basis of this series of articles, Mr. R. E. Cooke is recording some information. 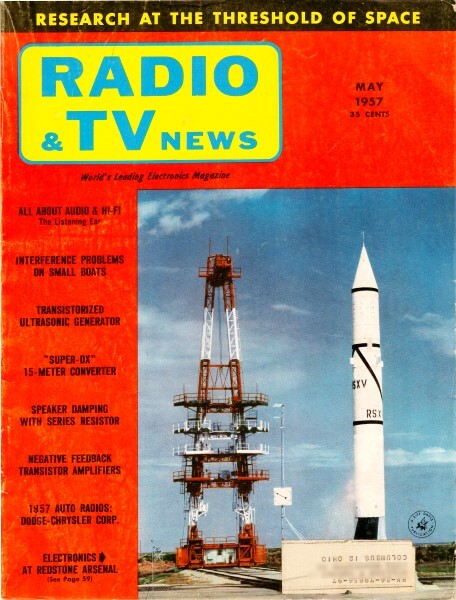 American radio and audio magazines are read with avidity over here, and it would be a good thing if British journals could include more contributions from American writers, although the usual rates of pay are rather thin; translated into dollars they would just about keep a moderate smoker in cigarettes. The title, "All About Audio and Hi-Fi," may be rather ambiguous. It does not mean that I am going to tell you all there is to know about it. (I do not know it all, nor do I think I know!) It simply means that I have a roving commission to deal with all or any aspects of the subject, I sometimes think that the term "high fidelity" has just about reached the limit set by the large notice which appears on the front door of a dance hall on Broadway, which reads: "Most Exclusive Place in Town - Everybody Welcome." It is now quite usual to see portable radio sets and record players advertised in England as "hi-fi"; but despite this the term means something when properly applied, and it is very difficult to replace by a better one. As the main basis of this and subsequent articles will be actual tests and experiments, a brief outline of the instruments available will not be out of place, although I always believe that the skill and judgment of the investigators mean more than the cost of the equipment employed. Photographs of the Wharfedale laboratory are reproduced in Figs. 1 and 2. In Fig. 1 the main item is, of course, our Mr. Cooke, but other items worthy of note are, from left to right, automatic response curve recorder, a.f. oscillator, microscope, stroboscope, vacuum-tube voltmeters, sound level meter, phase-angle and impedance meter, oscilloscope with camera, etc. Fig. 2. 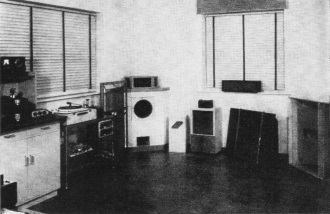 Another part of the lab showing some speakers used for comparative tests. When listening to loudspeakers in unusual rooms, allowance must be made for differences compared to furnished rooms in which domestic speakers are normally used. For instance, the laboratory in question has a longer reverberation time and sounds much brighter than an ordinary room. Some beneficial acoustic treatment has been applied; perforated Celotex tiles absorb excessive high frequencies over part of the walls, and half a dozen acoustic absorbers, designed by R. E. Cooke, each 5 ft. x 2 ft., operate in the range 100 to 8000 cps. (One of these can be seen in each photograph.) These units combine the functions of a Helmholtz resonator, stagger-tuned over the frequency range 700-1300 cps, and a membrane absorber. Nevertheless, I still prefer to make a final loudspeaker test at home, when domestic types are involved. Room effects obviously play havoc with any loudspeaker response, although they do not invalidate the merits of level response as a starting point. 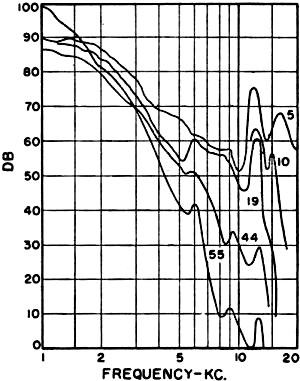 In view of the importance of listening tests, we cannot do better than devote the remainder of this article to an elementary study of the function of the human ear as related to the problems of sound reproduction. Its main qualities could, I think, be classified very simply as follows: (1) Sensitivity, or general acuity of hearing; (2) Response, or variation of acuity with frequency; (3) Tonal discrimination and power to assess volume levels accurately; (4) Sense of pitch; (5) Musical reaction and talent; and (6) Uniformity of qualities 1 and 2 between left and right ear. For our purpose, the most important is No.3, tonal discrimination, but we will deal with the others first. Fig. 4. 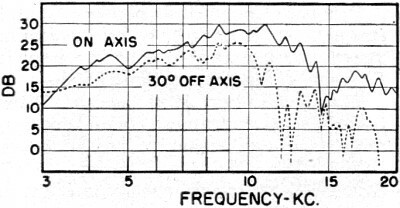 Response curves of the 3·inch speaker used in the listening tests. But experience shows that professional musicians are often poor judges of quality No.3, and may be defective in qualities 1 and 2. (Beethoven was deaf for many years.) The reason for No. 3 failure is that the musician usually spends so much time near to the source of sound. I remember at rehearsals in the Royal Festival Hall, the organist Ralph Downes always maintained that we were reproducing the organ too loudly when he came into the body of the hall to listen. Similarly, a member of an orchestra hears something quite different from the conglomeration of direct and reflected sound heard by members of the audience. Volume level has a lot to do with it; I always maintain that the art of attaining realistic reproduction starts with setting the volume control correctly. The slightest touch up or down can make all the difference. The organist, when playing on a console placed near the pipes, hears less than his audience, but a member of an orchestra hears more, so the training for No.3 is poor in both cases. It is also difficult for very musical people to ignore the music and performance, and concentrate on quality of reproduction. Many hi-fi fans err in the opposite direction! Qualities 1 and 2: At the outset, we must be careful not to attach too much importance to acuity of hearing. We have already agreed that it has little to do with musical ability, and it is fairly easy to prove that sensitive ears are not necessarily discriminating ears, any more than a man with good eyesight is ipso facto an artist or a good judge of line and color. But a reasonably good range of hearing is obviously required before any reliable assessment of tonal quality can be made. This was brought home to me recently during a rehearsal for a record concert, the items for which had been chosen by a talented musician and composer, who was apparently stone deaf above 5000 cycles and so remained quite oblivious to surface hiss, plops, and screaming highs which came from some records. 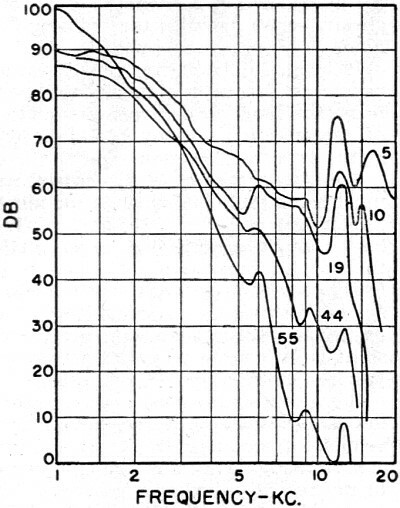 It is well known that hearing at high frequencies falls off with advancing years, but constant use of the ears in listening tests delays the decay. The September, 1956 issue of Wireless World contained an interesting article on age, hearing, and hi-fi, entitled "Too Old at -?" by M. G. Scroggie, who said that those of us who are not so young as we were may be wondering why we should spend a lot of money on equipment for reproducing frequencies we cannot hear. Some measurements made on a few individuals by Mr. Scroggie are reproduced in Fig. 3, the numbers against the curves indicating the ages of the people tested. Frequencies below 1000 cps are omitted because no significant differences occur. A 3-inch unit with aluminum voice coil and light Bakelized cone was used as the sound generator. Although not flat, the response goes up to 20,000 cps (see Fig. 4) and the unit should be at least as good as a headphone. I was astonished that all those tested - ages between 20 and 46 - could actually hear 18,000 cycles (usually with a boost of 50 db or more) as I am stone deaf in that region. Now there are three people whose hearing and tonal judgment I have always rated very highly when assessing speaker performance. They are (1) my daughter, age 22; (2) our works manager, Mr. E. R. Broadley, age 46; and (3) myself. Please do not take the inclusion of myself as a sign of arrogance or conceit. We all think that what we hear is right because we never hear anything else. As a matter of interest, response curves of these three subjects, prepared by Mr. Cooke, are shown in Fig. 5. 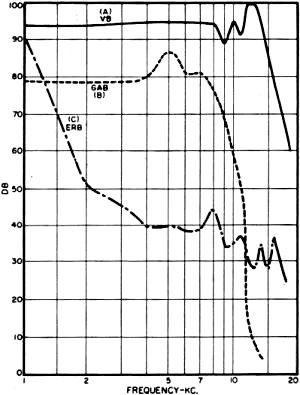 As already mentioned, Mr. Scrog-coil and light bakelized cone was used phones, no doubt in a very quiet room, and in such circumstances the threshold-level Fletcher-Munson curve gives appropriate compensation. These tests show that it is possible for a young person of 22 to hear perfectly up to 14,000 cycles and quite well up to 18,000 cycles, Our sales director, Mr. Escott, age 31, and Mr. Cooke, age 32, kept within 15 db of this standard up to the 18,000 cycles limit imposed. Although I can actually hear 14,000 cycles, I was shocked to learn that I am some 90 db down at this frequency. The most interesting ears belong to Mr. Broadley, whose acuity is below mine up to about 10,000 cycles, but then remains very even up to 18,000 cycles, in spite of his 46 years. He has been making and testing loudspeakers along with me some 25 years, and I rate his judgment of performance very highly. The general conclusion, as a result of these tests, is that loss of hearing with advancing years is frequently not as bad as has so often been assumed, and the faculty of hearing - in common with many other human accomplishments - is preserved by regular exercise or practice (like playing the piano or knitting). Fig. 5. Hearing curves taken with speaker held a few inches away from the right ear. Curves are corrected for loudness contour and are smoothed below 3000 cycles. Curve (A) is for Miss Briggs. age 22; curve (B) is for G. A. Briggs. age 66; and curve (C) is for E. R. Broadley, age 46. See text. It is a pity that deficiencies in hearing cannot be adjusted by "spectacles" which are so easy to prescribe for the eyes. Deaf aids are little better than resorting to any port in a storm. Quality No.6: Few people hear equally with both ears, but I believe the natural tendency is to adjust the balance by turning the weaker ear towards the source of sound, so that quite wide variations could exist in one pair of ears without disqualifying the owner from a shrewd exercise of tonal judgment. 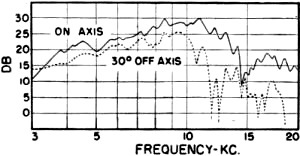 Quality No.3: As with the gift of perfect pitch, the main basis of tonal discrimination is memory, coupled with the ability to hear and recognize resonances, harmonics, transients, and all the other qualities which go to make up a musical picture, plus a sensitive reaction to any form of distortion. An appreciation of music and regular concert-going to keep the ears fresh are obvious advantages. Anybody who unwittingly plays records too loudly or too softly is disqualified from the start, and it does not matter whether his amplifier is 10 watts or 100 watts. The "larger than life" platoon cannot be admitted into this select company. Again in common with the gift of pitch, you either have tonal judgment or you have it not, and it is easily recognized in listeners when demonstrating sound equipment to various people, in spite of enormous variations in preference and taste. A spark of the talent - and talent it undoubtedly is - can develop into a flame by regular use. I suppose the most skilled in the art are recording engineers who almost daily compare live with recorded speech and music and can recognize on a monitor speaker which piano out of a half a dozen studio models is being played. My complaint is that recording engineers hardly ever write about their activities (probably due to hush-hush policy) so views on the subject are left to be aired by semi-skilled but interested parties like your humble servant. The most difficult application of tonal judgment - after recognizing that something is wrong - is the ability to recognize where the trouble originates. Poor recording, bad studio acoustics, line distortion, antenna or reception faults on FM, pickup distortion, amplifier faults, speaker trouble, listening room coloration, wrong setting of playback characteristics, wrong volume levels; these and many other sources of error need watching before final performance can be fairly judged. For instance, the quality from FM at its best is so good that any shortcomings in the quality of program material are ruthlessly exposed on wide-range reproducers. A poor record via FM may sound as though the loudspeaker is out of center, and may actually sound better on a small speaker in a resonant cabinet than on a hi-fi system. So we will conclude this article by stating that tonal discrimination is the most vital quality of the ear in audio activities, and that it involves placing a source of distortion quite as much as noticing it. In short, do not always blame the loudspeaker. In our next article, we will have a look at room effects.